Baldrick : It had a cunning plan. Darth Vader : Because it could not resist the power of the Dark Side. Fox Mulder : It was a government conspiracy. Gilligan : The traffic started getting rough; the chicken had to cross. If not for the plumage of its peerless tail - the chicken would be lost. The chicken would be lost! Scully : It was a simple bio-mechanical reflex that is commonly found in chickens. Jerry Seinfeld : Why does anyone cross a road? 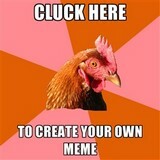 I mean, why doesn't anyone ever think to ask, 'What the heck was this chicken doing walking all over the place anyway? Mr. T : If you saw me coming you'd cross the road too!